LONG BEACH, NY and JOHANNESBURG, SOUTH AFRICA, October 10, 2018. 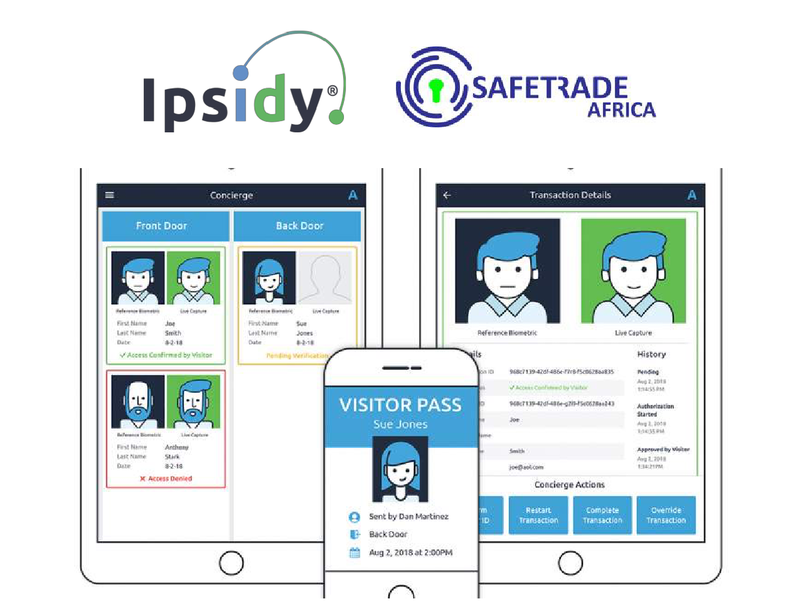 – Ipsidy Inc. (www.ipsidy.com) [OTCQX: IDTY], a provider of secure, biometric identification, identity management and electronic transaction processing services, and Safetrade Africa, (www.safetradeafrica.com), a technology development company specialising in payment processing in secure environments today announced their agreement to offer Ipsidy’s suite of biometric identity and authentication solutions to South Africa, African countries south of the equator, as well as the Indian Ocean islands of Madagascar, Mauritius and Seychelles. In a world of increasing digital and mobile transactions that is accompanied by widespread data theft and fraud, traditional customer identification and authentication methods are no longer adequate. Ipsidy’s identity transaction platform leverages the convenience of lower-cost mobile applications to help customers authenticate the identity of the person on the other side of everyday transactions. Our platform facilitates a range of such transactions, including payments and physical or digital access, embedded with the participant’s authenticated identity. The joint offering will initially comprise VerifiedTM, and AccessTM, Ipsidy’s out-of-the-box, mobile, biometric identity solutions. Requiring no integration, Verified leverages the Ipsidy Identity portal to seamlessly authenticate a user’s identity (be they a customer, or employee) from the convenience of their own smartphone. A business agent using Verified, can simply login to the Ipsidy portal to trigger an authentication request to a user’s registered mobile phone. Ipsidy’s mobile identity application puts your users in control of their identities and lets them authorize transactions before, not after, they have been approved. Users quickly capture their ‘selfie’ in their trusted Ipsidy mobile application to authenticate their identity and approve everyday transactions. Ipsidy’s platform converts the selfie into a biometric facial template that is matched against a previously enrolled reference template. Access helps protect any perimeter and create a safe environment by monitoring the enrolled identities of people moving in, out, and around any defined area. Enrolled participants whether residents, employees, visitors, customers, students or patients, use Ipsidy’s mobile-identity application to provide quick and secure biometric identification at their arrival and exit. Ipsidy’s tablet-based Concierge application and low- cost Bluetooth beacons are used by the site’s attendant to provide real-time monitoring of enrolled participants’ entry and exit transactions. The Concierge app provides the tools to register and verify users’ identities while also furnishing reporting and analytics. Safetrade Africa is a private limited company registered in the Republic of South Africa. Opening our doors in 2002 as a technology development company specialising in payment processing in secure environments. Safetrade Africa has a 100% South African Shareholding and is the holding company for Mobile Merchant (PTY) Limited. Safetrade Africa continually searches for ground breaking ideas and technology to bring to market, whether that be in South Africa, Africa or globally. For Sales enquiries, please contact Safetrade Africa on +27 11 803 3509. Ipsidy Inc (OTCQX:IDTY) www.ipsidy.com is a provider of secure, biometric identification, identity management and electronic transaction processing services. Ipsidy is headquartered in New York and has operating subsidiaries: MultiPay in Colombia, www.multipay.com.co; Cards Plus in South Africa, www.cardsplus.co.za; and Ipsidy Enterprises in the U.K. Our identity transaction platform creates a trusted transaction, embedding authenticated identity and event details with a digital signature and using a participant’s mobile device to approve everyday transactions. Our platform offers biometric and multi- factor identity management solutions which support a wide variety of electronic transactions. We believe that it is essential that businesses and consumers know who is on the other side of an electronic transaction and have an audit trail, proving that the identity of the other party was duly authenticated. We continue to enhance our solutions to provide our customers with the next level of transaction security, control and certainty over everyday transactions. Further information on Ipsidy can be found at www.ipsidy.com or contact us at sales@ipsidy.com. Information contained in this announcement may include “forward-looking statements.” All statements other than statements of historical facts included herein, including, without limitation, those regarding the financial position, business strategy, plans and objectives of management for future operations of both Ipsidy and its business partners, future sales, product and service launches with customers and new initiatives and customer pipeline are forward-looking statements. Such forward-looking statements are based on a number of assumptions regarding Ipsidy’s present and future business strategies, and the environment in which Ipsidy expects to operate in the future, which assumptions may or may not be fulfilled in practice. Implementation of some or all of the new services referred to is subject to regulatory or other third party approvals. Actual results may vary materially from the results anticipated by these forward- looking statements as a result of a variety of risk factors, including the risk that implementation, adoption and offering of the service by customers, consumers and others may take longer than anticipated, or may not occur at all; changes in laws, regulations and practices; changes in domestic and international economic and political conditions and others. Additional risks may arise with respect to commencing operations in new countries and regions, of which Ipsidy is not fully aware at this time. See the Company’s Annual Report Form 10-K for the Fiscal Year ended December 31, 2017 filed at www.sec.gov for other risk factors which investors should consider. These forward-looking statements speak only as to the date of this announcement and cannot be relied upon as a guide to future performance. Ipsidy expressly disclaims any obligation or undertaking to disseminate any updates or revisions to any forward-looking statements contained in this announcement to reflect any changes in its expectations with regard thereto or any change in events, conditions or circumstances on which any statement is based.